theAd>> This shelf has a million uses. 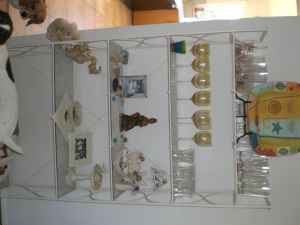 I had it in my bathroom/dressing area with pictures and towels and knick knacks. It is currently in my dining room with glassware and fine things displayed. It is darling and unique with the interesting scrollwork on either end. It is 71" x 10 1/2" x36" with five glass shelves. It is brand new looking. I would think this would work well in my low gravity vacation moon base.